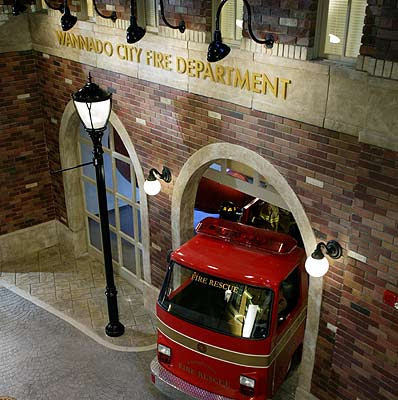 Wannado City is a theme park the size of three football fields built in the middle of Sawgrass Mills, a shopping centre complex in Fort Lauderdale, Florida. It is a kid-sized replica of a real city and the little ones behave like adults here. They work, are (mostly) law abiding, put out fires and deposit their pay-cheques into an interest earning account at the State Farm Bank. Not in dollars, but in Wongas, the official Wannado City currency. The value of money is very important to the inventor of Wannado City. "This city for kids should be as close to reality as possible," says Luis Laresgoiti, 41, a tall slim Mexican man who sets out his vision in a quiet, soft voice. "Money is the most important fuel in every city and every country – also in Wannado City." 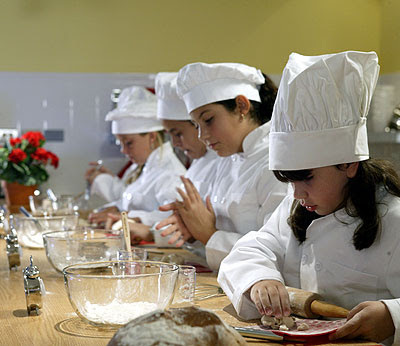 Children three to 13 years old can choose between 120 different professions. In addition, 12 sponsors and their logos give the children's work the stamp of reality. [...] The money that the kidizens (junior citizens) accrue is managed at the State Farm Bank, an American financial firm that offers insurance and bank services. 'Watch how your Wongas grow,' exclaims the bank slogan. Hidden interests are discovered in Wannado City, says [mother Judy Odsess]. "Sarah didn’t know what she wanted to do, now she wants to go in to television." The state of Florida agrees. Schools are sending entire classes on school trips to Wannado City with the blessings of the teachers and the parents. Judy Odsess also likes Wannado because it’s safe for her daughters. A security system inspired by the casino city Las Vegas takes care of total child protection. In Wannado City no one is unemployed. The choice of profession is free and the middle class is intact. Outsourcing doesn’t exist. Wannado City presents itself as a city without any ideology. ~Peter Hossli, "When I Grow Up", Open Skies (reproduced at Hossli.com), 1 November 02005. For those of us not blessed to live within an SUV ride of Fort Lauderdale, Florida, it's possible to get a sense of what the Wannado City experience might be like through a variety of home videos posted at YouTube, where one also finds that local TV news services have filed cooperatively infomercial-esque stories about the park (link). Since journalist Hossli interviewed its founder, however, some of the intended verisimilitude appears to have been traded in for unadulterated fantasy. Wannado City has lately been advertising a Jurassic Park-style "dinosaur adventure" in which "an era is reborn" and "mysterious creatures from the past are unleashed" (link). This move highlights the challenge, ubiquitous in pedagogically-oriented simulations, of blending education with entertainment: it's easy to lapse into excess of one or the other. The experiential learning idea behind the $40 million facility (a figure quoted in a TV news spot linked above) here is fascinating to me. 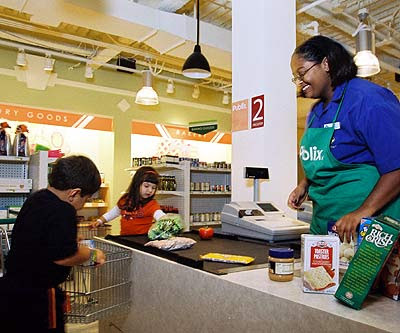 Visiting kids get a chance to do "what they wanna do" (i.e., when they grow up), sampling any of 120 professions, meanwhile earning and spending in the Wannado City micro-economy set within the giant Sawgrass Mills Mall, the largest shopping centre in the state of Florida. It would be great to see some scholarly analysis of the educational attributes of this experience, but a search at Google Scholar for "Wannado" turns up only a few English-language papers, the main theme in which seems to be the use of RFID tags in patrons' wrist-worn tracking devices. Even putting to one side the Foucauldian surveillance apparatus at play here, and notwithstanding its claims to be a "city without any ideology", it's not hard to spot a distinct ideological bent mixed in with all the fun. Where some onlookers will discern valuable learning, or harmless amusement, others are sure to find consumerist indoctrination. 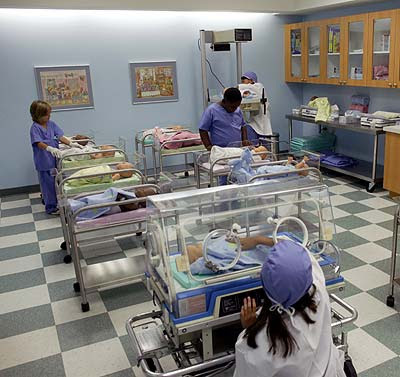 Of course, all that depends on your politics: what's intriguing me from a futures perspective is that the role-play here recreates occupations that are liable to change radically, or even disappear, by the time these kids enter the workforce. Whether or how this matters is an interesting question that goes to the heart of what we believe education is about. My bias, of course, is that in times of massive change, to prepare ourselves and our children for situations that don't yet exist is at least as important as being skilled in existing ones. Which leads me to wonder about the prospects for role-playing and simulation settings that offer the opportunity to experience not only existing jobs (and animatronic dinosaurs), but also -- or instead -- ways of life that could exist in times to come.